Trumpet performer and educator John-Thomas Burson has pursued his passion for music across a diversity of arenas. With a special fascination for new music, he performs with Anima Brass, a Long Island chamber ensemble which actively commissions and presents modern works for the brass quintet. Burson devotes equal attention to solo performance, appearing recently as featured soloist with the Georgia Symphony Orchestra and Kennesaw State University Symphony Orchestra. 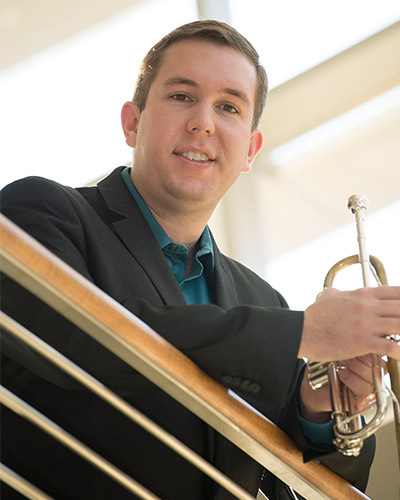 In solo recitals, John-Thomas often programs rarely performed or new works for trumpet, including a premiere in April by Stony Brook University’s Nathan Hudson. For the past two years, he was selected to attend the internationally-acclaimed Aspen Music Festival, where he performed alongside preeminent conductors, soloists, and ensembles including Midori, Gil Shaham, Robert Spano, Vasily Petrenko, and the American Brass Quintet, to name a few. He was the 2014 winner of the International Trumpet Guild’s Sonare Pro Brass Scholarship and was a finalist in the National Brass Symposium Orchestra Excerpt Competition. Upcoming performances include concerts with the Stony Brook Symphony Orchestra, Anima Brass, and the Three Village Chamber Players. Burson holds a Bachelor of Music (B.M.) in Performance from Kennesaw State University (near Atlanta, Georgia), where he studied with Thomas Hooten, Michael Tiscione, Douglas Lindsey, Karin Bliznik, and Jennifer Marotta. He currently resides in New York where he is pursuing a Master of Music (M.M.) in Performance at Stony Brook University, under the guidance of trumpeter Kevin Cobb of the American Brass Quintet. www.johnthomasburson.com.